This dark and mysterious thriller stars Nikolaj Lee Kaas (The Killing, The Whistleblower) as brooding, grumpy cop Carl Mørck, who lands the thankless job of sorting through cold cases after his previous assignment leaves one of his partners dead and the other wounded. Carl sifts through the boxes and stumbles on a bizarre missing persons case. The case involves the disappearance of Merete (Sonja Richter, The Homesman), who vanished in a strange occurrence on a ferry. With no body on board and no body afloat, people just assume she either fell or jumped off the boat. 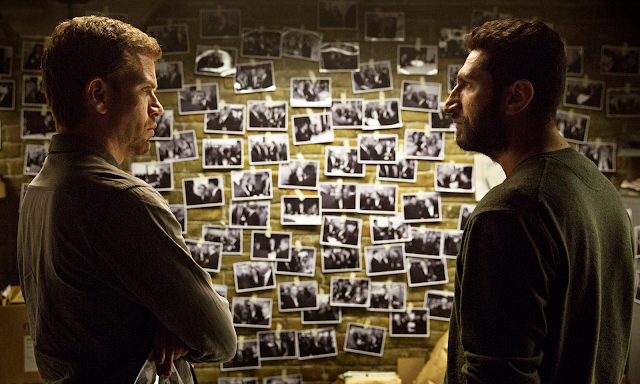 Carl reopens the case with his new partner, Assad (Fares Fares, Zero Dark Thirty), and together the revisit the clues and evidence, which includes reviewing a range of shoddy cop work and being patient with Merete’s withdrawn and mentally challenged brother (Mikkel Boe Følsgaard), who was the last person to see her on the boat. Their investigation reveals a trail that any decent cop should have discovered. It becomes apparent that Merete was probably murdered. Cut to a dark, dank cavern. It’s a pressure chamber. In it, a woman shivers with fear as a voice beckons through a speaker. It’s Merete. She’s alive, for now. The Keeper of Lost Causes plays with perceptions of time as the screenplay by Nicolaj Arcel (A Royal Affair) fractures the timeline to generate suspense. Carl’s story and Merete’s story move at different paces. His investigation reveals that five years have passed, but when we first see Merete, the unseen voice—a Jigsaw-like sadist—leaves her with two buckets and says that he’ll return in one year. There’s no way anyone could survive such confinement and deprivation. As the two narratives converge and Carl learns more about the case, the question becomes not what happened, but whether he chases a ghost. The dark edge of Keeper of Lost Causes seems cater-made for fans of the Swedish Millennium trilogy as Carl and Assad tag team the case like Lisbeth Salander and Mikael Blomkvist: one is a brooding anti-social curmudgeon, while the other is more hopeful and chipper. Strong performances from Kaas and Fares create an effective buddy cop dynamic with the former playing the bad cop and the latter playing the good one. They’re fun together, and Fares especially brings a lightness and humour that offsets the sombreness of Kaas’s performance. Similarly, the original Swedish title of the Millennium trilogy’s first instalment, Men Who Hate Women (known here as The Girl with the Dragon Tattoo), could apply here just as easily as does to the cornerstone of the popular computer hacker trilogy. The heart of Merete’s disappearance is one of psychopathic misogyny and Carl’s investigation touches upon men who prey on women as witnesses give evidence that the key to Merete’s case is a one-night stand that began maliciously, unbeknownst to her. Similarly, the progress of her incarceration in the pressure chamber reveals a ruthless pleasure her captor (a creepy Peter Plaugborg) gains from watching her. She’s an object meant for his cheap thrills and victory. The tension unfortunately flattens two-thirds away through the film as Keeper of Lost Causes reveals the outcome of Merete’s disappearance in a thorough montage, but the film remains entertaining as a straightforward procedural as Carl compels himself to seek justice for Merete at any cost. Moody cinematography ensures a lingering sense of menace at every turn, too, as Carl encounters twists in Merete’s story that should never have been buried in a box in the bureau. The secret in Keeper of Lost Causes isn’t so much in the eyes of the players, but what dangers linger in the shadows of familiar places. The Keeper of Lost Causes screens at the European Union Film Festival on Saturday, Nov. 21 at The ByTowne. It also screens at EUFF Toronto on Saturday, Nov. 21 at The Royal.